Dog-leg maneuvers are nicely explained in @JakeBlocker's excellent answer. If you go there now (and hopefully come back here) you can see a diagram of a dog-leg maneuver along with a comparison to an actual dog's leg! (their knees ankles go the same way as Boston Robotics' knees go, opposite ours). With two large coastlines that face open oceans both East and West in two industrialized states, rockets can be launched in several directions, including polar, without the need for dog-leg maneuvers. In fact, as @PearsonArtPhoto points out in this excellent answer the satellites of some countries orbit the Earth retrograde - the opposite direction of most satellites and the rotation of the Earth - because of a lack of East-facing coastlines. So I'm wondering if dog-legs are mostly a thing of the past, or if there are still some dog-leg hot spots, places where dog-leg maneuvers are still used regularly? If so, where are they used most frequently? 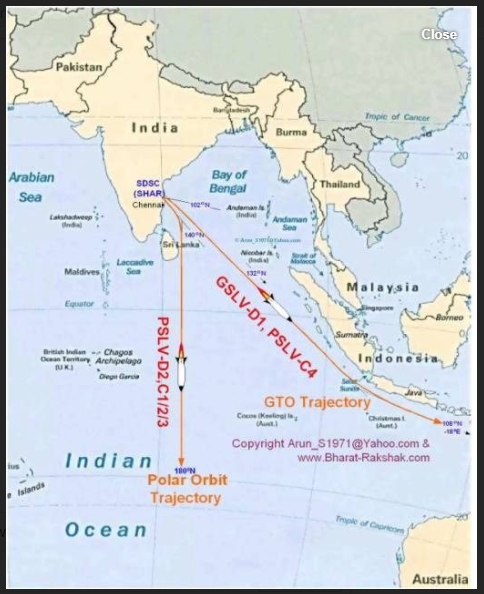 As ISRO launches from SHAR towards Bay of Bengal, they don't have much of launch azimuth, which is limited (can't recall the exact value). Whereas NASA and Rocketlab have pretty good launch azimuth range. So to launch PSLVs from SHAR, they use lower launch azimuth and then they do a dogleg maneuver to use the required launch azimuth. Not the answer you're looking for? Browse other questions tagged launch launch-site launch-trajectories or ask your own question. The strange orbit of Ofeq 11 - how does it (actually) do this? What orbital inclinations will be launched into from Scotland? Are there any space vehicles in which it would be possible to launch yourself into space on your own? Are there any downsides to high TWR rockets? Are there any events planned to celebrate Sputnik's 60th anniversary today?